A couple pictures of our crew at The Last Word - 17 people in total! And the "dealer's choice" volcano bowl we requested, which was a Hemingway Daiquiri. Much fun was had by all! The FB event link is here: https://www.facebook.com/events/1645346409067656/ It's a private event, so I'm not sure if you can see if it you haven't been invited, but people can just ask me for an invite. Right now it looks like I'm the only other person in for Friday lunch, although Nancy said on FB that if she and Bob arrived in time, they might be interested. I have a Google doc I'm using to keep track of RSVPs across the two different websites. I will share it with you. What time are people available for cocktail hour/dinner on Friday? I need to make a reservation. Zingerman's sells a cheese cone and a meat cone, so that's one way to try some different things at bigger quantity. They're not really well advertised, but just ask for it and they'll hook you up! Hello Heartlanders! Long time no see. I can be available for a lunch outing on Friday, there are lots of options depending what people are in the mood for. Mani Osteria and Spencer are two that come to mind off the top of my head. When it comes to Zingerman's, the sandwiches are good, but they're still just sandwiches. And expensive ones at that. Plus if you go during normal mealtimes, particularly on the weekend, there will be a big line. 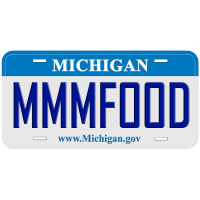 Much better, IMO, to eat at one of Ann Arbor's other great establishments, but go to Zingerman's for shopping and sampling. You can sample *everything* they sell, so it's a great opportunity to try 150 year old balsamic vinegar or an unusual cheese or honey or whatever floats your boat. Sounds like you like beer - Jolly Pumpkin is great if you like sours. And their food is awesome too. Arbor Brewing Company (ABC) is another good brewpub downtown. Wolverine Brewing on the west side of town for a fascinating selection of lagers. And the new Glasshouse Brewing also on the west side, which gets great reviews but I haven't been to yet. Bill's Beer Garden at Downtown Home and Garden is also a really fun spot with a variety of choices on tap. My favorite memories of Steven are from the Ann Arbor Heartland Gatherings. He and I were the expediting team, figuring out how to organize the many courses into some sort of coherent meal. I remember him convincing Kris to tempura fry something (in her bare feet) nearly every year, although she always swore she wouldn't do it again. And when I wanted to recreate a dish I'd had at Jose's Minibar, Steven picked up his phone and convinced the kitchen to give him the recipe. My world is much less interesting without Steven in it. "Eleven Madison Park: The Cookbook"
I'm planning to make the sweet potato beignets for a dinner party on Friday. I'm wondering about their suitability for advance prep. The timing seems fiddly with the instructions to freeze for 30 minutes, roll into balls, then coat in panko. If I refrigerate them after this step, will they hold their shape for frying a la minute? Should I just fully freeze them in the first step, and pull them early to allow them to soften before rolling and frying? I'm sure the restaurant has them prepped and ready to pop in the fryer, so just trying to figure out the best method for doing that. Anyone have experience/opinion? Does anyone have a recipe for using Transglutaminase to make peanut butter noodles? I've seen lots of references to the techique, but nothing with even an idea of proportions. Thanks! Cooking with "Heston Blumenthal at Home"
Made the red cabbage gazpacho and mustard ice cream for a dinner party I catered recently. It's definitely a suprisingly tasty combination! Then tonight, I made the garden salad with sauce gribiche for a potluck. To say it was a big hit would be an understatement. And so fun to do! I'm going to do a couple of big ones for an event next week. Will probably doctor up the sauce gribiche with some cream cheese to give it a little more bulk and a consistency more capable of holding up aspargus spears. Looking to get a reservation for either Tickets or 41 for a trip in July. I know that Tickets reservations start 2 months in advance. 41 claims 90 days on their online booking page, but they also say 100 seats, so I'm not inclined to believe that information very much. And someone below said they were releasing for April in Mid-March? Does anyone have any solid information? Is there a specific time of day tickets are released? I'd read 12 am in one place, i'm seeing 12 pm below... any tips? Remind me about hollow molding technique? I'm teaching a chocolate molding class on Tuesday night, and we're making hollow Easter eggs in addition to standard bonbon type stuff. But it's been forever since I've done it, and I could use a refresher. I have the two piece polycarbonate molds that have little notches to fit together. As I recall from the last time I did this, I decorated the molds with colored cocoa butter, gave them a coat of tempered chocolate with a brush, then put some tempered chocolate in one half, put the other half on, and shook it all around. Is that right? How much chocolate is ideal to get a good thickness of shell? Anything else I should remember to keep in mind? Late to the party, but here's the link to my "cooking for 40" thread: I have a higher budget, but not as fully stocked a pantry.